Our crown block is built in accordance with API 4F and 8A, with the certificate of authority to use the official API monogram. It also meets the requirements of industry standard SY/T5527. Being quenched, the sheave groove is anti-abrasive, resulting in longer service life. A wireline guide device is equipped to prevent the wireline from being out or falling off. In addition, our crown block is equipped with anti-vibration wood and protection net, sand block and assistant block, as well as gin pole for block servicing. The sheaves of crown block and mated traveling block are interchangeable. Rugao Yaou Company is one of the crown block manufacturers and suppliers in China. In addition to our drill rig parts, we can also provide oil drilling tools, solid control equipment, well cement tools, and more. These products are characterized by reliable quality and reasonable prices, and are exported to many countries, such as Russia, Germany, America, Singapore, Australia, Brazil, and so forth. We look forward to serving more global customers. You are welcome to contact us for more information on our oil drilling equipment. 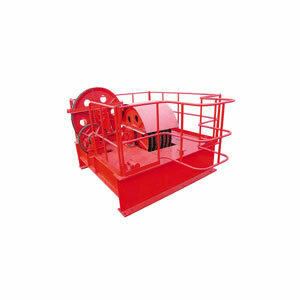 Rugao Yaou Company has supplied high quality mud pumps and mud pump parts to global customers for several years. Our F series mud pumps have achieved the level of LTV Co. F series mud pumps in terms of manufacturing technique and quality.